Every few years, the massive Shadewalker lifts itself from torpor and rambles to a new location—which forces the citizens of Shadewalker Shanty, the trading settlement that has built up under the Shadewalker’s protective bulk, to relocate their town. 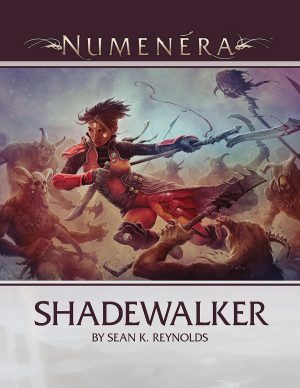 For the first time in memory, though, the Shadewalker has done something different. Is the giant machine leading the town into danger? Or becoming a threat itself? It’s up to the player characters to find out! Shadewalker is a short introductory adventure for Numenera, complete with pregenerated characters so you can jump straight into the action. And it’s a great introduction to Cypher Play Season 18-1 (January through April 2018)—which itself is a lead-in to the launch of Numenera Discovery and Numenera Destiny.